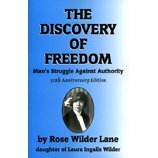 For my birthday last month, a well-read patriot and dear friend sent me a copy of The Discovery of Freedom, Man’s Struggle Against Authority by Rose Wilder Lane (daughter of Laura Ingalls Wilder of “Little House on the Prairie” fame). “This is not only the clearest, most concise book of the worth, and means of achieving, individual freedom, but it reads like a well written novel. Insights from her travels; whether having dinner with the King of Albania, or visiting the centuries old cave dwellings in the same country or dealing with the mindless red tape in Paris, Ms Lane sifts through the socialist failures past and present in a thorough, yet entertaining fashion. This morning as I was going through my email, I came across these quotes which complement perfectly the message of The Discovery… Coincidence? Or is my mind already sensitized to these concepts? “Government is taking us a long way down the Road to Serfdom. That doesn’t just mean that more of us must work for the government. It means that we are changing from independent, self-responsible people into a submissive flock. The welfare state kills the creative spirit. F.A. Hayek, an Austrian economist living in Britain, wrote ‘The Road to Serfdom’ in 1944 as a warning that central economic planning would extinguish freedom. … Hayek meant that governments can’t plan economies without planning people’s lives. After all, an economy is just individuals engaging in exchanges. The scientific-sounding language of President Obama’s economic planning hides the fact that people must shelve their own plans in favor of government’s single plan.